Al Ahly director of transfers Mohamed Fadl says he has received permission to sell Bafana Bafana forward Phakamani Mahlambi. Mahlambi has been linked with a return to the Absa Premiership to join Mamelodi Sundowns, however they didn’t match Al Ahly’s asking price, according to KingFut. The Brazilians will have to match the club’s asking price of about R27.7 million if they are to sign the former Bidvest Wits forward. 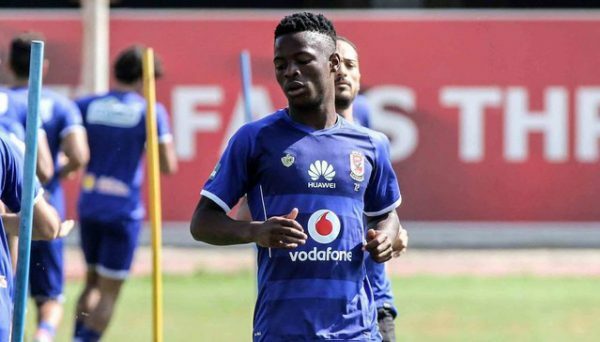 “We have signed Phakamani Mahlambi for €1.3 million (about R20.7 million), but we might sell him for around $2 million (about R27.7 million) because we see him as a very good player,” Mohamed Fadl told KignFut. “He is a big player and plays for the South African national team, but we have very special foreign players, and that’s why he is currently in this situation. “Phakamani doesn’t want to continue with Al Ahly and we have got approval from Patrice Carteron to sell him. We can’t force him to stay. “But we can’t buy Phakamani for €1.3 million and then sell him for only €500,000 (about R7.9 million),” he added.